The Cadet Restaurant. A roadside giant. 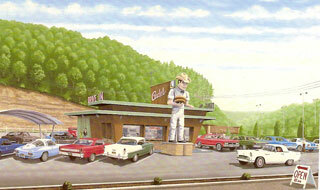 Serving up thick, juicy hamburgers and delicious dinners for over sixty years. Known for the Poorboy sandwich, the Cadet was originally founded in 1952. We serve classic American-style cuisine that will leave you reminiscent of the days of muscle cars and carhops. We hope to be serving you sometime soon! Take the tour of our history, we've been here for a number of years. Get directions from there to here with just a few simple keystrokes. Learn more about our regularly scheduled car cruises at the Cadet.